These days there are plenty of social media platforms to get exposure for your streams. However places like Facebook, Youtube, Periscope and Twitch don't let you collect the emails of your attendees, pull them on screen, do paid events or a long list of other crowdcast features. Using multistreams you can stream your crowdcast to multiple sites and ask them to join you in Crowdcast for additional benefits like asking questions, joining the chat, and coming up on screen. This way you can start taking the audience that the social media algorithms own and collect emails to own the relationship between you and your audience. The following are the steps you need to take to set up the streams before you go live. If you decide to stream to a 3rd party service after you've already gone live, you can reset the session using the "more" menu and then follow the steps. 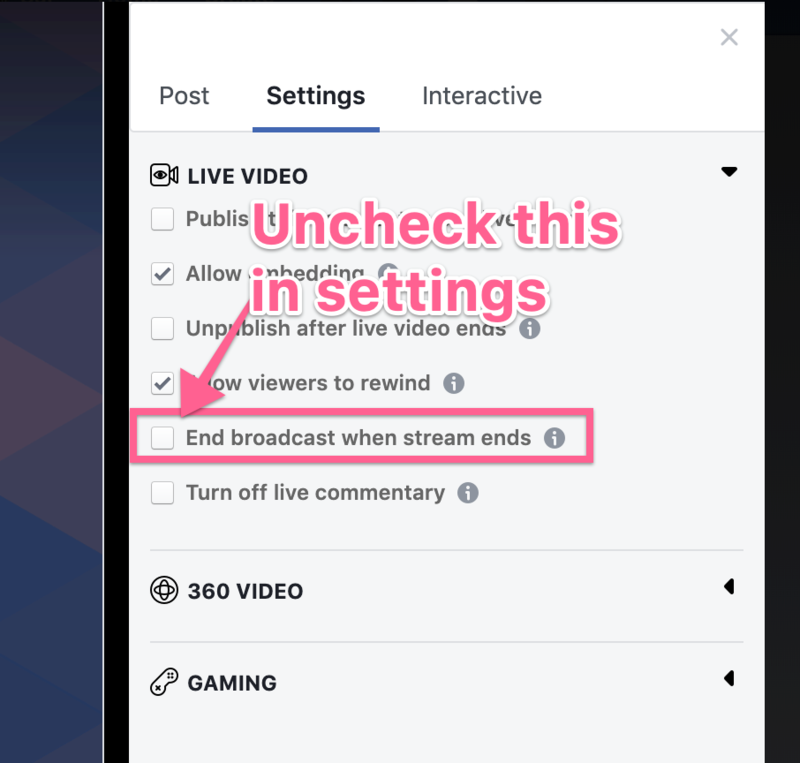 To stream your event directly to Facebook Live from your event Edit options, follow these steps. 3. 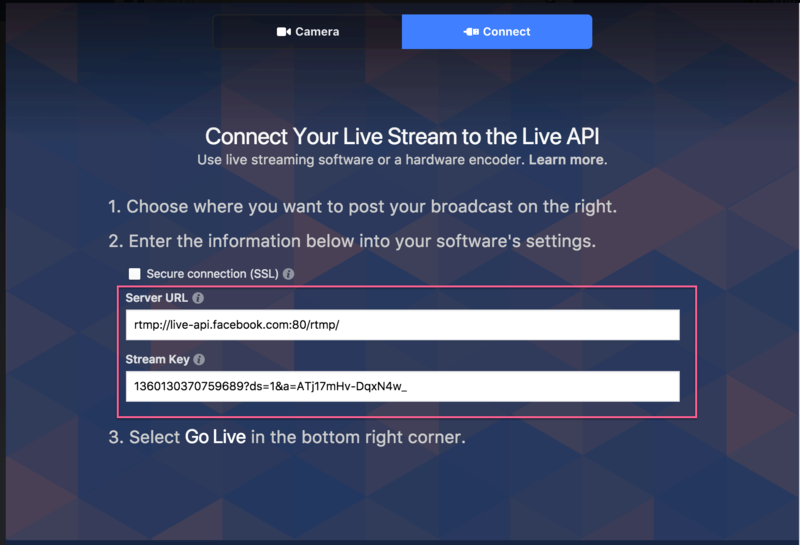 In this example we will stream our Crowdcast event to a Facebook page but at this point pick where you want to stream into and fill in the Title and "Say something about this live video". We recommend pasting the crowdcast link here so that viewers on Facebook can join you on crowdcast by registering for your stream. 4. Then click on "Settings" and un-check "End broadcast when stream ends"
5. When you're ready to go live, copy the Server URL and Stream Key. 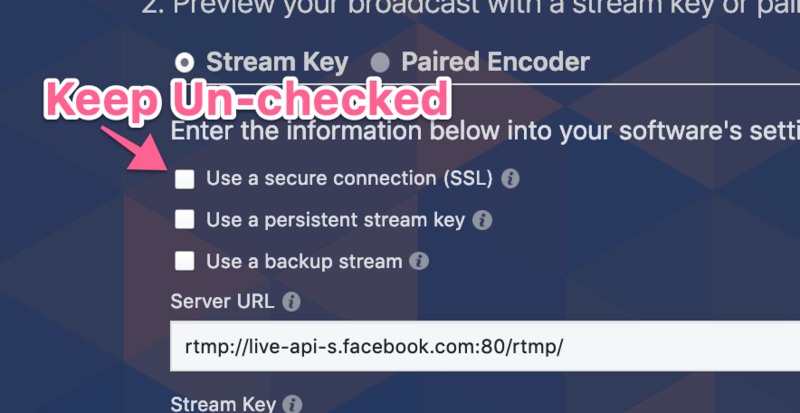 IMPORTANT: When you choose or change the destination of your live broadcast, Facebook changes the Stream Key to a new one. Do this step only after you've confirmed the destination of the live broadcast. If you copy the Stream Key too early, you may risk the multistream not working. 6. Next, select the session of your event you that you want to stream to Facebook and paste in the Server URL and Stream Key as shown below and hit save. 7. You've now connected your session to Facebook :) When you're ready to broadcast, hit the "Go Live" button in Crowdcast and in about 10 seconds, the Facebook video preview window will start showing your video stream and the "Go Live" button in Facebook will be enabled. 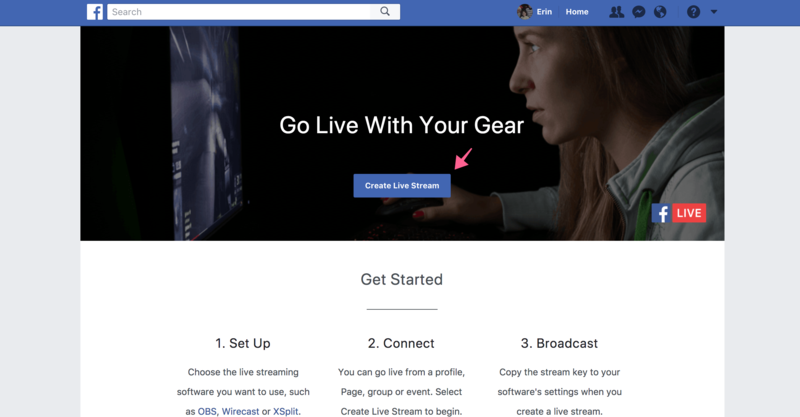 If you want your event to start streaming automatically on Facebook Live when your Crowdcast event begins to broadcast, you can do that by clicking the dropdown menu next to the Go Live button and selecting Schedule Live. Otherwise, you will need to follow the previous steps right before your Crowdcast goes live. To stream your Crowdcast event to YouTube Live, first visit your YouTube live video dashboard. 2. Under "Encoder Setup" copy the Server URL and Stream Key. 3. In your Crowdcast event Edit options, pick the session you want to stream to Youtube, and paste in the Server URL and Stream Key as shown below and hit save. 4. You've now connected your session to YouTube! Now proceed as usual to get ready to go live. When you're ready to broadcast, hit the "Go Live" button in Crowdcast and in about 15 seconds the YouTube Live Dashboard will start showing your video stream and the status at the top will switch to "Starting" and then "Live". You're now streaming to YouTube live. When you end the broadcast in Crowdcast, it will automatically end on YouTube. Crowdcast can stream to other 3rd party services like Twitch. If the service can provide you with an RTMP endpoint then it may be possible to send your Crowdcast stream there but you would need to test it first. To set it up, choose the "Custom" option and enter the Server URL and Stream Key they provide. 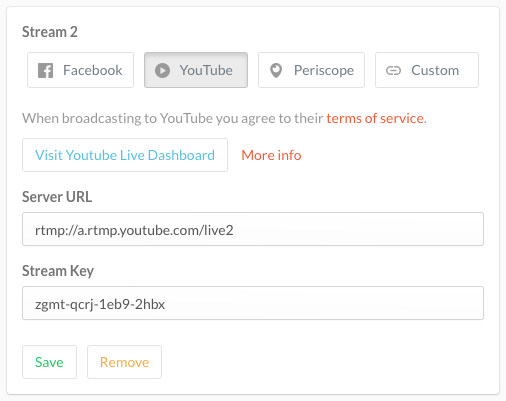 When you go live in Crowdcast, the stream will start sending to the RTMP endpoint. Streaming to third party services is in 720p HD (1280 × 720 pixels) for in-browser crowdcast sessions. If the session is streaming using RTMP Studio, you can stream up to 1080p. Questions or feedback? Please shoot us a message. We're always making improvements and would love to hear from you.